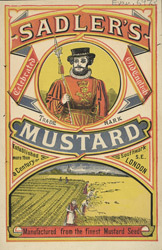 The first known mustard recipe dates from 42 AD and was known as 'mustum ardens', which meant burning juices. The Romans used mustard seeds to preserve and flavour their food, but it was not until the 18th century that mustard appeared on English tables. George I was a devotee of the condiment and set a trend for eating it with roast beef. This leaflet shows a Beefeater guard in uniform and below him an illustration of agricultural worker harvesting the crop.